Have you missed our latest livestream? No worries, we’ve got you covered. Watch it here or find the key take-outs from our session with Crypterium CPO below. The Crypterium Card is a one-of-a-kind payment solution. To ensure that all our users clearly understand the wide range of possibilities enabled by this revolutionary product, Crypterium CPO went online on March 18 to answer all questions from our community and offer some hints on what’s coming next in terms of product development. Lazy reader? 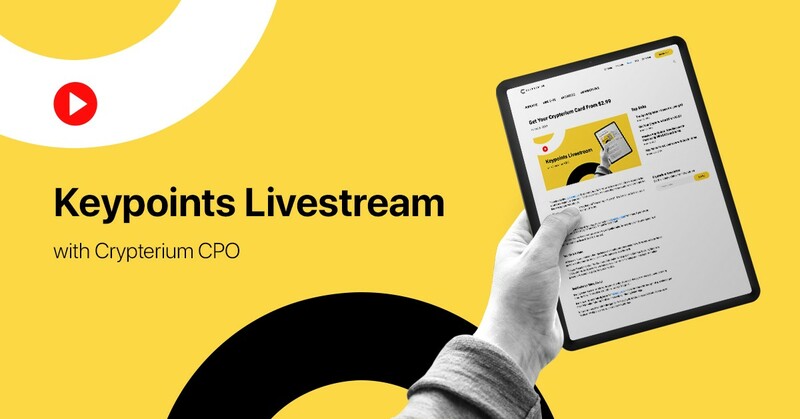 Watch the livestream here. Crypterium wanted to deliver a truly unique product, one that the market has never seen before. That’s why we’ve created the first global crypto card and are issuing Union Pay cards. This payment system is the Chinese alternative to Visa and MasterCard. UnionPay International is accepted in 174 countries and a vast majority of all US merchants work with it. The Crypterium Card was designed with users in mind. You know what we say… “Your Money — Your Way”. That’s precisely why we let you use any currency (BTC, ETH and LTC) in the Crypterium App to top it up. For the moment, CRPT will not be available for top-ups. The reason is simple: CRPT was conceived as a utility token, not a payment currency. From a technical standpoint, it’s possible to implement. If you would like to use CRPT to top up your card, let us know on Telegram. To guarantee that you always get the best exchange rates when loading your card, we’ll use with Crypterium SX — a powerful bid-matching solution integrated with the world’s top exchanges. 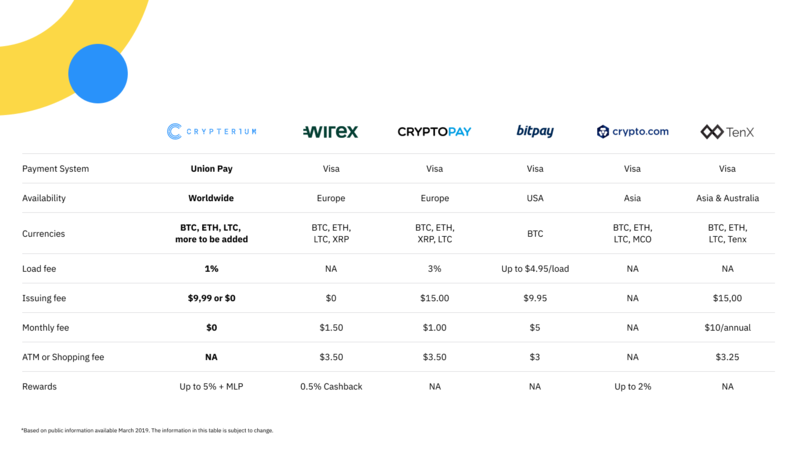 All top ups are subjected to a standard 1 percent fee that consists of a 0.5 percent partner fee and a 0.5 percent CRPT fee — as stated in our whitepaper. This fee is automatically charged from the total top up amount. As for transactions, those made outside the Philippines — the country where the cards are issued — include a 2 percent cross-border transaction fee. Within the next six months, we’ll be rolling out local solutions offering lower fees for our top markets, such the US, Europe, Asia and Russia. There are two options to get your hands on a brand-new Crypterium Card. You can either buy it for a one-time payment of $9.99 (delivery costs not included) or get it for free by upgrading your Crypterium subscription plan. There are three plans. By default, all our users are Crypterium Basic — which offers a convenient $1,000 crypto-fiat transaction monthly limit and it’s 100% lifetime free. We also have Crypterium Plus, a plan that increases your crypto-transaction limit to $5,000, as well as the number of digital assets available in your app. Moreover, this plan introduces two new features: priority support and savings account. Last but not least, Crypterium Premium — our most comprehensive plan. Apart from enhancing the services mentioned above, this option also adds account insurance and a personal manager. For Crypterium Plus and Crypterium Premium subscribers, the card is for free. It’s important not to confuse crypto-transaction limit with card limit. These are two separate things. The crypto-transaction limits applies for all operations within the app, excluding the card. The Crypterium Card has outstanding limits on its own: $10.000 daily / $60.000 monthly. The first one thousand users that pre-ordered the card will get it for free. The good news? You can be among them. By joining the referral program, users will be able to get ahead in the line. Keep in mind that Crypterium will only work with market leaders, the ones that offer real value to our community. We intend to work hand-in-hand with those projects and move forward together. Cashbacks: Are You Ready To Fight? Yes. We’re currently working on the deployment of Crypterium’s Monthly Loyalty Program (MLP). The Crypterium Card will certainly boost transaction volumes in a short period of time, making the MLP conditions and potential loyalty rewards more attractive for users. All the specifics about this program will be published a bit later. Additionally, Crypterium Plus and Premium users will access a savings account — a transparent and safe way to earn interest from your crypto assets. If you take into account all perks we offer, the numbers will definitely add up. It’s all about being fair to our most loyal users. We want to give you a chance to order the Crypterium Card before anyone else. That’s why we’ve been keeping our marketing efforts on hold. Nevertheless, we’ve seen very positive results even without paid advertisement. We have already 8,000 pre-orders and the count keeps growing. For our next release we’re planning to include the redesign of your profile tab, activate Crypterium SX and turn the exchange feature back on. Next month, we’ll be releasing a new feature: MasterCard payouts. As recently explained by COO Austin Kimm, this feature will enable users to send funds directly to any MasterCard in the world at minimal fees.